alliance put together by the super villain Magneto for purposes of antagonizing Marvel Comics' X-Men. Both had problems with the villainous way of life, however, and when the group broke up, in 1965, became part of the first wave of recruits in The Avengers. They remained with that group for years — in fact, Wanda (The Scarlet Witch's non-superhero name) wound up marrying another member, The Vision. 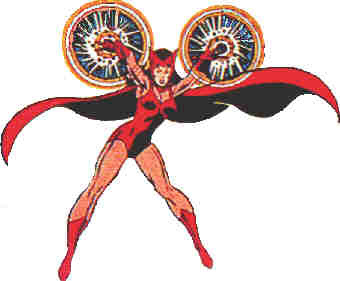 The Scarlet Witch is unique among superheroes, and not just because she's the only one who wears a wimple. Her super power is unlike any other — she can alter probability so as to cause mishaps for her foes. In other words, she "hexes" them. At first her hexes were rather haphazard, but with years of practice, they've become both stronger and better controlled. Like Pietro (her brother Quicksilver's non-superhero name), Wanda has only limited and confused knowledge of her own early life. The two were raised in eastern Europe under the name Maximoff, but it later appeared they were the offspring of a pair of 1940s Marvel superheroes, The Whizzer and Miss America. A later writer claimed their true father was Magneto, the founder of the Brotherhood of Evil Mutants, and that's the currently accepted version. Wanda has done her share of hopping from one superhero group to another. She has, at one time or another, been a member of The Defenders, Force Works, West Coast Avengers, and an all-female group called The Liberators. But she keeps coming back to the Avengers core group, where she and her husband are among the longest-tenured members. Text ©2000-02 Donald D. Markstein. Art © Marvel Comics.